Both rental and homeowner vacancies rose slightly in 2018. The rental vacancy rate rose to 4.4% in 2018, still below the historical equilibrium of 5.5%. It was lowest in 2016 when it was just 3.6%. The homeowner vacancy rate rose slightly in 2018 to 1.2%, level with the historical average. 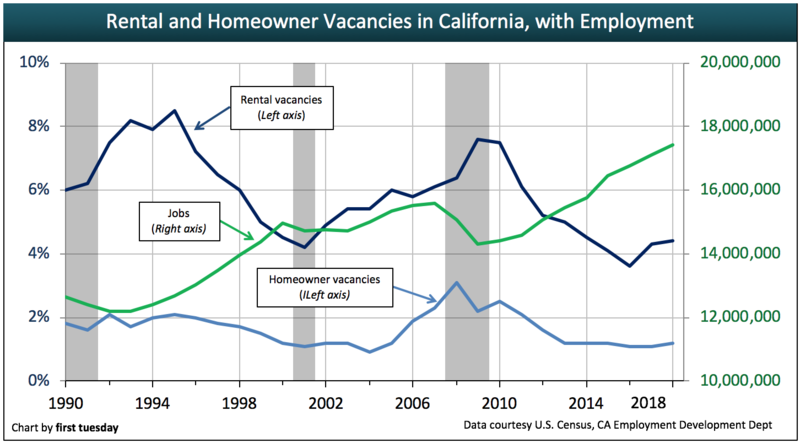 Vacancies are influenced by a number of factors, including California’s growing job market, which encourages more household formations to occur. However, construction starts need to rise to offset the decline in vacant rental units, otherwise the price of rents will rise for failure to break ground. This has already occurred in city centers like Los Angeles and San Francisco, where residential rents are well above average. Post updated March 3, 2019. Original copy posted January 2011. Residential vacancies continue to decrease as the effects of the 2008 recession slowly diminish. At the height of the recession, dead lawns and the constant presence of “For Sale” signs stood out as vividly as missing front teeth do on the face of a smiling child. These vacancies blighted neighborhoods and provoked crime, destroying the wealth of neighboring homeowners. Heavy residential vacancies, an indicator of an improperly functioning local economy, were the norm from about 2006-2011. Heading into 2019, residential vacancies are at a normal level at 1.2%. Rental vacancies are still below normal, as the demand for rentals has outpaced new rental construction in the years following the foreclosure crisis. 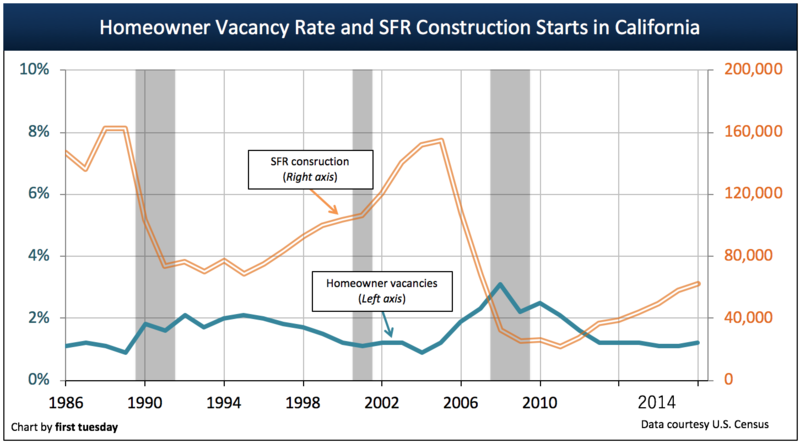 A look at trends driving vacancies during the past recession and recovery cycle provide a glimpse into what vacancies can tell us about the direction of the current recovery. unsold and vacant housing inventory not for lease. The vacancy rate to which homeownership vacancies consistently return in California is roughly 1.2%. As the economy strengthens and then weakens, through population growth then housing starts, actual vacancies will run below the equilibrium (as in 2005) and above it (as in 2010). Presently, homeownership vacancies — comprising primarily homes for sale — are just below the normal vacancy rate. unrented and vacant and held out for sale-or-lease, or just for lease. The vacancy rate to which residential rental properties return in California is roughly 5.5%, a pivotal figure for property managers and investors (at the end of 2018, it was 4.4%). Homeowners are less likely and, in many recessionary real estate markets, simply unable to sell, pack up and move, tethered to their homes by property price corrections, negative equity and a dearth of users as buyer-occupants. Like homeownership vacancies, the rental vacancy rate varies above and below this pivotal mean figure depending on conditions of a full recovery or a recession. Presently, the rental vacancy rate is below normal. This decreased rate was once due to higher than normal homeowner vacancy rates — those who either lost their homes or decided to put off homeownership after the Great Recession but still needed a place to live and have filled up rental properties. Now, the low rental vacancy rate is partly attributed to the slowly recovering construction industry, which while growing, has failed to keep up with rising demand for rentals. This isn’t builders’ fault either. Strict zoning regulations in desirable areas limit new multi-family housing. The relationship between homeowner and rental vacancies is one of undulating equilibrium. When home prices are high and it makes more financial sense to rent, vacancies in rental housing go down and homeowner vacancies go up. Other factors can influence this equation, like the massive foreclosure and short sale crisis that has just recently begun to subside. Over time, the dominance of one type of housing (homeowner vs. rental) is equalized by a shift in favor of the other type of housing, a fact borne out by simple arithmetic. For instance, as more and more individuals continue to favor rental housing, the demand for rental housing causes landlords to increase rents to maximize profits. This, in turn, eventually translates into more lucrative conditions for homeownership, as well as construction opportunities for builders and investors. However, builders took advantage of the lush lending conditions of the early and mid-2000s. As a result, they introduced massive inventories of SFR housing units into the market with relatively little durable demand by end users. By the mid-2000s, the historical trends pulling on both types of vacancies were jolted loose by rapacious mortgage money management and vacancies became unanchored, to soar as they did. The introduction of new housing units into the homeowner/rental vacancy equilibrium is not in and of itself a disruptive event. This is simply because the California population grows (consistently around 1% annually since 2001, and at the moment primarily comprised of net births over deaths). However, the sheer volume of SFR construction introduced into the housing-saturated Millennium Boom real estate market was not only disruptive, but disastrous. A brief history lesson will demonstrate how builders got carried away. In the early 2000s, just as the economy was beginning to slip into a corrective recession, the Federal Reserve (the Fed) stepped on interest rates to stimulate growth in hasty reaction to perceived business recession due to the September 11, 2001 terrorist activities. The Fed change in monetary policy did not allow the ongoing 2001 recession to complete its work to cool down excessive real estate prices brought on by the recovery in 1998. These low interest rates encouraged lenders to lend — which they did in spades through Wall Street bond market funding. The Fed later took no steps to withdraw the excess funds they had prematurely pumped into the banking system after September 11, 2001. The money flowed like wine, luring all manner of borrowers to gulp from the proffered cup. Among those who drank most deeply were builders. They borrowed and built since money was available from local bankers to do so. For, contrary to popular belief, builders do not build in anticipation of current or future housing demand. Rather, they build because there is money available for them to do so. Editor’s note — Observe that even as the rental vacancy rate (the purple line) rose, builders did not cease their building of multi-family apartment buildings (the red line). The expense and scope of building multi-family units kept that boom from reaching the proportion of the single family residence (SFR) building spree, but it nonetheless illustrates the unrealistic doggedness of builders with money. When the Millennium Boom began in earnest in 2002, more people began to jump on the homebuying bandwagon. Naturally, rental vacancies began to rise. However, the homeowner vacancy rate (the teal line) began to rise uncharacteristically with rental vacancies, even during 2004-2006 when buyers (users, buy-to-let investors and speculators) were all pouring into the market at the same time. The concurrent increase in construction of residential units kicked homeowner vacancies to upwards of an unprecedented 3% level by 2008. In contrast, the recent previous peak in building permits (the orange line) during the late ‘80s was met with a relatively modest, but extended period with a homeownership vacancy rate of 2%. The overbuilding during the late ‘80s was fended off, then and into the early ‘90s, with a weapon the current real estate market continues to lack: household formations. 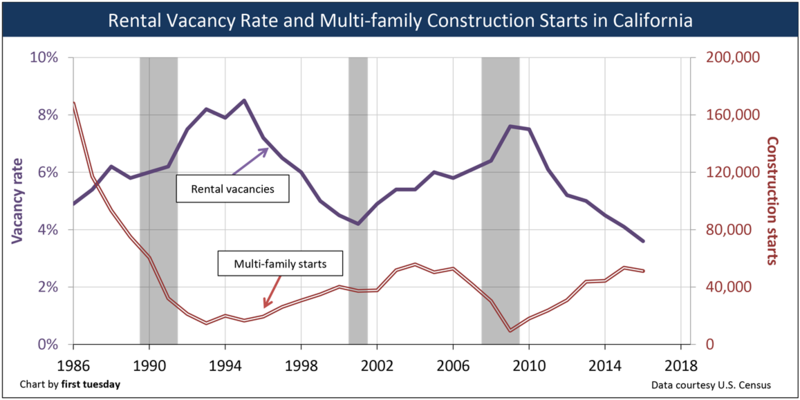 As observed in the vacancy and construction chart, the actual peaks of both SFR and multi-family housing unit starts came in the late ‘80s. Fortuitously, the blind overbuilding of that decade came at the same time the Baby Boomers were forming families and moving into rental housing or buying homes. The massive Boomer generation thus relieved the market of much of its excess inventory in the period immediately following the 1990 recession. With the latest building spate, which began in 1996, the builders charged full-steam ahead — and built housing for a declining market. The Boomers had already settled into their properties and the generation immediately following them (Generation X) was far less populous and more transient, leaving a glut of housing units on the market vacant. In an attempt to drum up household formations (and at the expense of more vacant rental housing), the federal government began a campaign to push the homeownership rate above its traditional 64% national threshold. 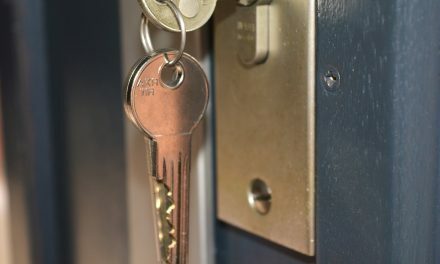 Part of this campaign came in the form of allowing seller concessions on mortgage loans – no down payment or funds for closing costs needed – now a highly-regulated and mostly prohibited practice. The efficacy of the government’s push for homeownership can be seen in the change in California’s homeownership rate (which is historically much lower than the rest of the nation) from around 54% in 1990 to nearly 61% at its peak in 2006. Nationally, the respective percentages were 64% and 69%. Government housing policy was now working overtime. Unfortunately, just like housing construction, the government’s push for homeownership was running on empty: Generation X simply did not have the population to keep the construction engine running. Thus, the SFR construction boom of 2000-2005 was driven by the availability of money, not demographics, let alone user demand. Many of the homeowners lured out of the woodwork to push that homeownership ratio were those who were, by real estate fundamentals, incapable of sustaining long-term ownership — as evidenced by the increase in the ratio of (unstable) adjustable rate mortgages (ARMs) to traditional fixed-rate mortgages (FRMs), and the rise of the now-infamous subprime mortgage. These temporary homeowners served to keep the homeowner vacancy rate down through the mid-2000s — the rental vacancy rate at the time was trending steadily upwards, since tenants of all types were vacating their rented premises to move into homes — all with government encouragement. In 2006, homeowner and rental vacancies began to rise again — in part because of the lack of homebuyers in the market, and in part because of the rise of the buy-to-let investor and the speculator. Speculators exited the market throughout 2014 after a year and a half of purchasing huge amounts of real estate in the hopes of selling it on a flip and making money on market momentum as prices are driven ever upwards by frenzied buyers. This can increase the homeowner vacancy rate, as they purchase properties from owner-occupant sellers and place the properties back on the market for resale – the flip. 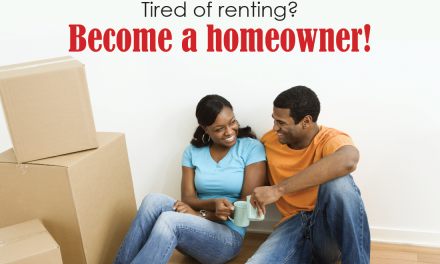 Buy-to-let investors purchase property with the intention of renting it out for the long-term. On a more limited scale, they also fell victim to the housing frenzy of the mid-2000s and purchased property away from owners (and to a lesser degree, speculators) to add to the number of rental housing units. Eventually, as the Boom wound down and prices began to drop, speculators were left with homeownership properties they could not sell at a profit. Slowly the speculators’ “For Sale” signs became “For Rent” signs. The then-burgeoning crisis placed both speculators and buy-to-let investors in the unenviable position of inefficient landlords: unable, as individuals, to find tenants as quickly or with the (relative) ease of larger apartment complexes. Thus, rental vacancies grew. The warning bells beginning in 2005-2006 (sales volume peaked in August 2005 and sales prices peaked in January 2006) tolled the coming of the 2008 recession, as many of the threads holding the real estate market together began to unravel. The other factor driving vacancies emerged like an angry bull after a red flag: foreclosures. Editor’s note — As the number of notices of default (NODs) declines back to healthy levels, reports on NODs became unavailable in 2015. Therefore, the chart above is only current through 2014. During the Boom, buyers of real estate (and their brokers and agents) completely lost track of the fundamentals behind the decision to buy a home versus rent it. The simple cost/benefit analysis multiplier which determines whether it makes financial sense for a tenant to become a buyer, also known as the gross revenue multiplier (GRM), went through the roof. 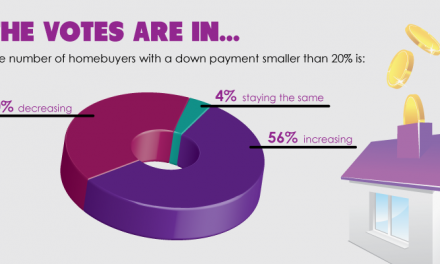 This impracticality came home to roost when the ARMs began resetting and homebuyers suddenly realized they could not pay more than the initial teaser rate payment on their mortgages, an amount roughly equivalent to rent. By December 2007, the recession had officially set in, brought on by Fed action to bring about a regular business recession (a precursor to lost jobs, which were yet to come) and an unanticipated number of mortgage delinquencies. In California, recording a notice of default (NOD) is the first step in the foreclosure process. The process ends when the property is sold at a trustee’s sale. In some cases, these trustee’s sales result in the property being sold back to the lender and then resold as real estate owned (REO) property, to remain vacant for months. However, in 2013, speculators bought up homes at foreclosure sales, reducing the number of vacancies – particularly homeowner vacancies. to buy-to-let investors or speculators who will both end up attempting to rent them, and whose inefficient attempts to do so will result in an increase in the rental vacancy rate (and lowering of rents). From 2008 to 2009, the sheer number of NODs and subsequent foreclosure sales eventually drove real estate prices back to their 1999 pre-Boom levels (and below inflation adjusted levels for 2001), creating a pocket of relatively cheap real estate prices, particularly in low-tier properties. High-tier property owners were better able to carry the mortgage payments on their devalued properties, which they could not sell for lack of mortgage lending (jumbo mortgages). But by 2010, defaults, foreclosures and resales at much lower prices began to appear in these wealthy neighborhoods with a vengeance. The shock of the housing crash and the flood of vacant inventory prompted both state and federal governments to attempt to stimulate tenants into becoming homebuyers by using tax subsidies to supplement their down payments. Thus, homeowner vacancies broke the upward trend in 2009 and briefly decreased. This reversal did not persist beyond the end of the subsidies in 2010. Today, NODs and foreclosures are at roughly normal levels. In the recovery period following the 1990-1991 recession, jobs increased as both rental and homeowner vacancies decreased. This makes sense: when people have jobs, they are able to form households by moving out on their own to occupy housing. The opposite occurred during the Millennium Boom. Vacancies rose in both homeownership and rental segments, sure signs the real estate market was over-saturated with property and thus could not sustain its breakneck pace forever, climbing steadily even as the number of jobs increased. Why? The economy, spurred by the false success of the housing market, over-hired. With scads of money being thrown at housing during the Millennium Boom, the number of jobs in construction, real estate and real-estate related financial services (lenders, mortgage brokers, insurers, sales agents, etc. ), skyrocketed. The money being earned by these industries seeped into other industries through consumerism, fueling more jobs growth in other economic sectors, and more construction, and so on — the virtuous cycle. When the recession hit in 2007 and false expectations of perpetual growth were dashed, the number of jobs plummeted, rippling from the real estate market on outwards. Jobs surpassed pre-recession levels in late-2014, however California has yet to regain enough jobs to keep up with the population increase of 1.7 million individuals that occurred during 2009 through 2018. As jobs continue to grow, individuals have cultivated the economic and social confidence needed to form households and bring vacancy rates back to normal (and then below normal, for rentals). 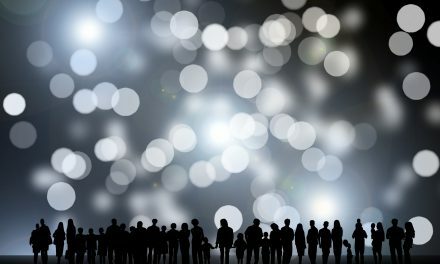 These future users of real estate will arrive in the form of the Baby Boomers’ children — Generation Y (Gen Y) — peaking in numbers in the years following the 2020 recession. Their function as the impetus behind the housing recovery will be, as always, contingent on the creation of jobs supporting their household formation. Without jobs befitting their college educations, members of Gen Y will be unable to leave their parental nests and move out on their own. They are shadow households — the users for the real estate which will, even after they come of age, need financial stability in the form of jobs before they can proceed to claim their households, and in the process reduce all types of residential vacancies. When they do succeed in finding jobs that will support households, most all of them will initially rent until they have settled into their jobs and communities. In a few years, after they have built up sufficient credit and wealth to qualify to purchase a home, many will do so and drive down the homeowner vacancy rate. Thus, similar to the injection of housing units which created the current distressed real estate market, the injection of Gen-Y households will serve to balance and return equilibrium to residential vacancies. Today, we see the rental market recovering first since new households and new job holders typically rent prior to entering homeownership. 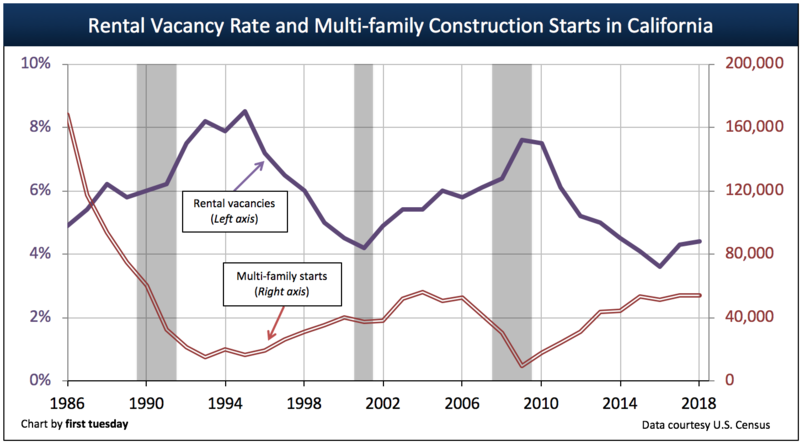 Today’s low vacancy rates herald more new construction in 2016 and the coming years. Brokers and agents can keep an eye on vacancy rates in certain niches of the market — cities, as centers of culture, commerce and government, will work through their inventory more quickly than will their suburban bedroom community counterparts. Watch for rentals in urban markets to dry up first and direct employment and investment efforts in that direction to reap profits in the future. NextPOLL: Where in the homebuying process do most buyers fail to act and kill the deal? What are the factors & aims, objectives on residential property. Its my project topic. Thank you. Very nice post, I am also associated with real estate, foreclosure Los Angeles County, California taxes and properties. I enjoy reading new stuff on this subject, and I hope you will be adding new and fantastic posts on property services. Thanks for writing such a wonderful post. Orange County actually has more people in their 40’s than their 20’s, so gen y is smaller there since a lot of babyboomers left the OC in the early 1990’s- and whites left big in the early 1990’s. Now, Mission Viejo has a lot of teengers, so past 2020 the y will help. I simply don’t think that Gen. Y, the echo boomers, will come around and save the day. We, that majored from Uni., mostly majored in soft majors that are not applicable in the American job market of today or tomorrow. The uni.’s should have capped, and should cap, the number of people graduating with “communication studies” and “art history” majors and so on. That won’t happen. So people graduating from uni. today are already finding themselves irrelevant in the job market. Most 19 year olds are unaware of this though. The educated members of Gen. Y will be like the young, but not so young, Japanese of 10 years ago and today, unwilling or unable to leave home, get married, or make babies. Come around to the time when Gen. Y finally decides to grow up and they will be inheriting homes from their dead parents i.e. not buying homes. What does all this mean with the glut in the housing market?-There won’t be a recovery in housing markets unless we let a ton more immigrants in to do the buying for us. Turnaround in 2013? Laughable. What prospects are there on the horizon? Even if there are some cutting edge new industries of the future that America can take part in, kids are still getting their degrees in unrelated fields. Don’t forget about all the school loans Gen Y has which they will also need to pay off before buying a house. Household formation will be delayed even further. Great article with loads of useful information – all something we surely felt as we are still trying to get back on our feet here in the “Golden” state. How it all comes together: property ownership, rentals, vacancies, and construction. This is the big picture. Thanks for a great article and illustrative graph.